Attach applicator tube to aerosol can with Scotch® Transparent Film Tape 600. Secure cookie tin lid with tamper-indicating Scotch® Heat Shrinkable Film Tape 6887. 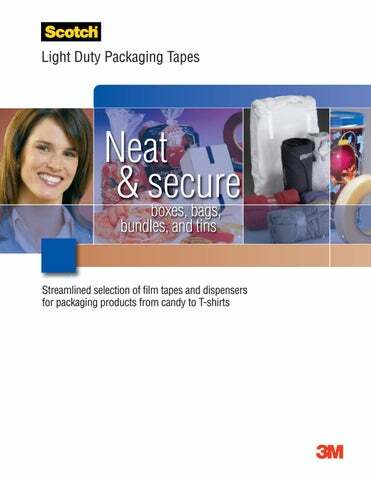 Bundle a wider range of fabrics with clean removal Scotch® Transparent Film Tape 640. Scotch® Manual Dispenser S63 applies a neat, consistently sized L-clip of tape in a single pass of a box. Scotch® Definite Length Dispenser M96 dispenses pre-set lengths of .75" to 5” per stroke. Scotch® Multi-Roll Dispenser P56/P56W for pull and tear of up to 6” total width of tapes. P56W offers weighted base. Scotch® Bag Sealer P400 applies tape in an adhesive-to-adhesive flag seal, includes bag trimmer. Scotch® Heavy-Duty Tabletop Dispenser C22 for pull and tear convenience. Note: This technical information and data should be considered representative or typical only and should not be used for specification purposes. Product Use: Many factors beyond 3M’s control and uniquely within user’s knowledge and control can affect the use and performance of a 3M product in a particular application. Given the variety of factors that can affect the use and performance of a 3M product, user is solely responsible for evaluating the 3M product and determining whether it is fit for a particular purpose and suitable for user’s method of application. Warranty, Limited Remedy, and Disclaimer: Unless an additional warranty is specifically stated on the applicable 3M product packaging or product literature, 3M warrants that each 3M product meets the applicable 3M product specification at the time 3M ships the product. 3M MAKES NO OTHER WARRANTIES OR CONDITIONS, EXPRESS OR IMPLIED, INCLUDING, BUT NOT LIMITED TO, ANY IMPLIED WARRANTY OR CONDITION OF MERCHANTABILITY OR FITNESS FOR A PARTICULAR PURPOSE OR ANY IMPLIED WARRANTY OR CONDITION ARISING OUT OF A COURSE OF DEALING, CUSTOM OR USAGE OF TRADE. 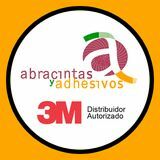 If the 3M product does not conform to this warranty, then the sole and exclusive remedy is, at 3M’s option, replacement of the 3M product or refund of the purchase price. Limitation of Liability: Except where prohibited by law, 3M will not be liable for any loss or damage arising from the 3M product, whether direct, indirect, special, incidental or consequential, regardless of the legal theory asserted, including warranty, contract, negligence or strict liability. SCOTCH Catálogo Cintas de Empaque y Despachadores. Selección optimizada de cintas de película y dispensadores. Para envasar productos desde caramelos hasta camisetas.